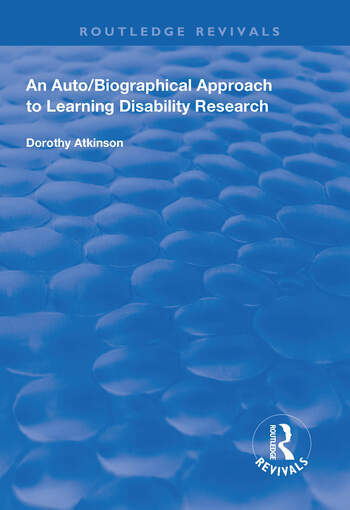 First published in 1997 , Dorothy Atkinson collects testimonies of the personal perspectives of people with learning disability in order to rediscover the histories of people with learning disabilities. Calling on the importance if auto/biographical research as mode to encourage social, historical awareness and potential understanding of the commonalities as well the differences between people with learning difficulties. 1. Introduction. 2. Research Issues. 3. The Research. 4. The Process of Life Review. 5. Compiling a Collective Account. 6. Narratives of Ordinary Lives. 7. Stories of Segregates Lives. 8. An Historical Account. 9. Meanings and Messages. 10. Reflections on Practice. Dorothy Atkinson is Professor of Learning Disability and Social Care at the Open University.